The Astronomical Society of Albury Wodonga and Charles Sturt University are collaborating to bring an exciting schools science program to coincide with National Science Week (16-24 August). The program will cover a wide variety of disciplines; from exploring the far-reaching corners of our universe down to how our bodies interact with our surroundings. 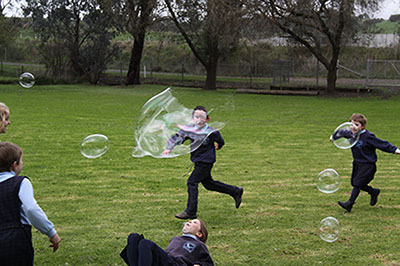 Running from 19-21 August at Charles Sturt University Albury Campus, the science week program consists of six activities covering cosmology, the human body, sound, forensics and sustainability targeting students from years 3-8. Students will learn how the stars and planets form and evolve as they take a journey through the solar system inside a portable IMAX cosmodome. They will explore sound as mathematician and bassist extraordinaire Tony Smith leads a musical forensic exercise. Students will piece together the sequence of events from the production of sound waves, the motion of those waves through the air and arrival at the ear to turn those sound waves into electrical signals in the brain. Students will also learn about their impact on the environment at the Wirraminna Environment Centre sustainability trailer as they examine energy and water consumption in their households and consider what this means for the future. They will follow local environmentalists as they describe the techniques they use to look after local fauna. Other activities will explore amazing senses as students learn to decipher Braille and help a blind-folded friend navigate an obstacle course. Remarkable abilities of the body will also be revealed with the help of different schools within Charles Sturt University. The School of Community Health will teach students the importance of movement and exercise, and demonstrate physiotherapy techniques. The School of Nursing ups the ‘ick’ factor by showing how bacteria colonise our skin, before illustrating the role of the heart as a pump and showing students how to use stethoscopes and blood pressure monitors. And students can help solve the murder of their favourite furry red monster in the Forensic Science presentation ‘Who Killed Elmo’. The use of DNA matching, fingerprints and blood types will be examined. For older students (years 9-12), Nobel Prize Winner in Medicine and Immunology Dr Peter Charles Doherty will present a lecture titled ‘Killer Viruses and our Immune System’. This is an incredible opportunity to hear a world leader in the field talk about his research and the challenges facing us, as air travel and global connectedness make us increasingly susceptible to pandemics as viruses spread through the populations of the world. In addition to the schools program, Dr Doherty will also be presenting public events on Thursday 21 August. Dymocks (Dean St) Albury will be hosting a book signing 10:00-12 noon, and at 7:00pm at Albury Entertainment Centre he will present the ‘Killer Viruses and our Immune System’ lecture to the general public (registration is not necessary).